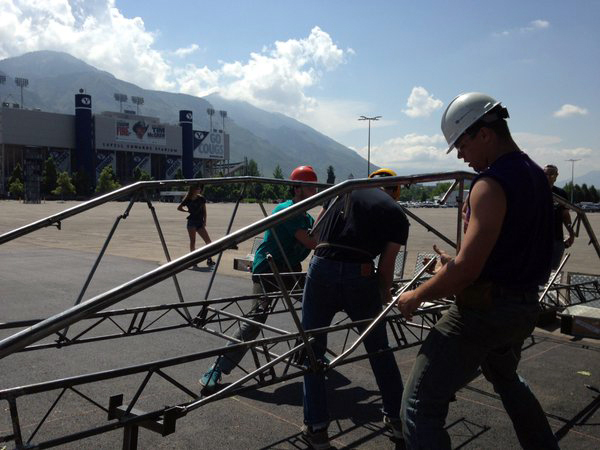 Lafayette’s team took fourth place at the National Steel Bridge Competition at Brigham Young University in Utah, May 27-28. This is the sixth time in 10 years that the team has finished in the top seven at nationals, a record matched only by University of California, Berkeley and University of California, Davis. More than 240 engineering schools entered one of 19 regional steel bridge competitions in 2016, from which 48 schools qualified for the national competition. Competing in the Mid-Atlantic region against schools such as Penn State, Maryland, Delaware, Drexel, Villanova, and Lehigh, Lafayette qualified for the national competition for the tenth time in the past 12 years. 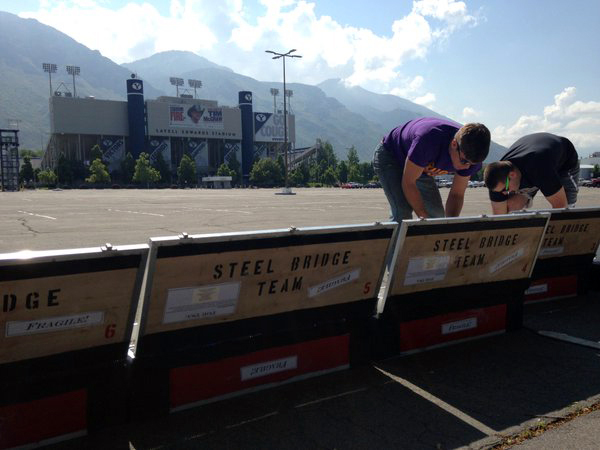 Sponsored by the American Institute of Steel Construction and American Society of Civil Engineers, the competition offers a student-driven project experience from conception and design through fabrication, assembly, and testing, culminating in a steel structure that meets client specifications and optimizes performance and economy. Teams are judged on construction speed, bridge weight, stiffness, lateral integrity, and aesthetics. The students spent nine months designing and fabricating all 61 parts of their bridge. A dimensional penalty of less than 1/8” was the difference between Lafayette’s fourth place finish and first place. “Next year, we will allow more tolerance,” says team adviser Steve Kurtz, associate professor of civil and environmental engineering. The team begins the design process each year in August with discussions of the new rules. The team then conducts hundreds of analytical studies in order to inform the ever-evolving design strategy. As a milestone, the team fabricates a fall semester bridge that is entered into the annual CE311 Bridge Competition, the intramural version of the national competition, which has been an integral part of Lafayette’s civil engineering curriculum since 2003. From this learning experience, the final bridge is redesigned with fabrication commencing in February. This year’s team included senior civil engineering majors: Tory Bingaman, Colin Cavanagh, Andrea Jacobs, Daniel Ma, Mary Madden, Chris Nelsen, Dwight Norrgard, Ben Prevosnak, Brian Skalla, Brody Smith, Kerry Teemsma, Alexandra Willey, and Kevin Yell.